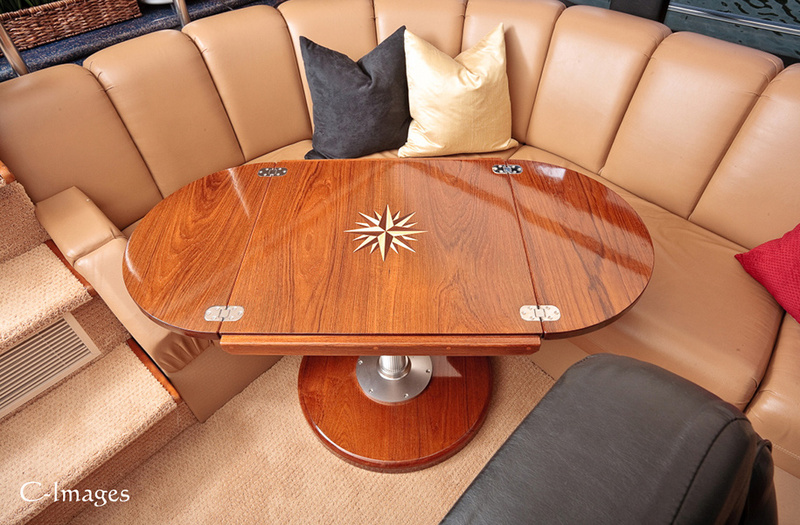 A finished teak dining table is the culmination of class for a yacht or sailboat. 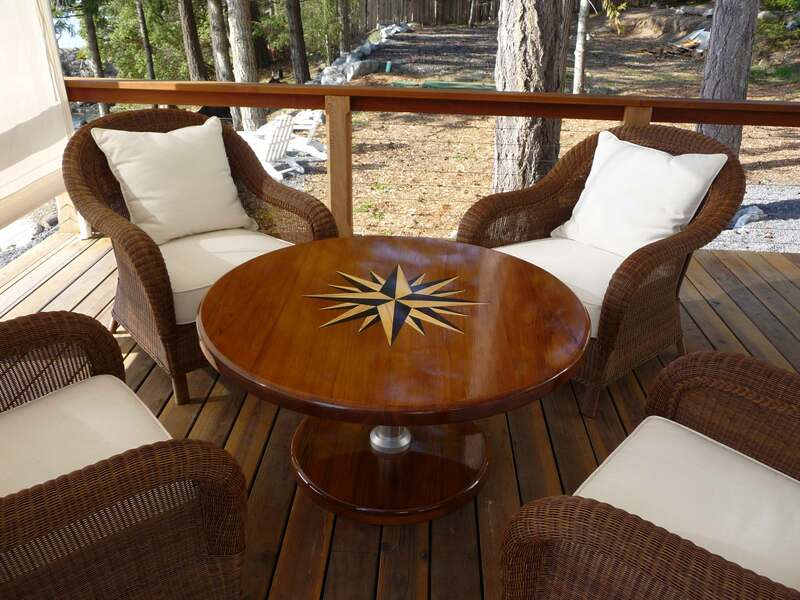 Cruising Concepts has been pursuing teak accessories and furnishings for recreational use since our inception and our accrued portfolio of work has given us experience with any cabin or deck dimension. Our dining table designs are perfectly measured to ensure the right balance of seating room and surface space. We’re very proud of our folding table designs that cut storage space in half and enable dining tables to be stowed in sleeper position. All folding tables come with stainless steel hinge plates that are installed flush with the table surface, minimizing any disruption to aesthetic or function. All of our dining tables come standard with pneumatic aluminum legs in single or dual pedestal designs. The table feet are crafted from teak to match the table’s color and shape. 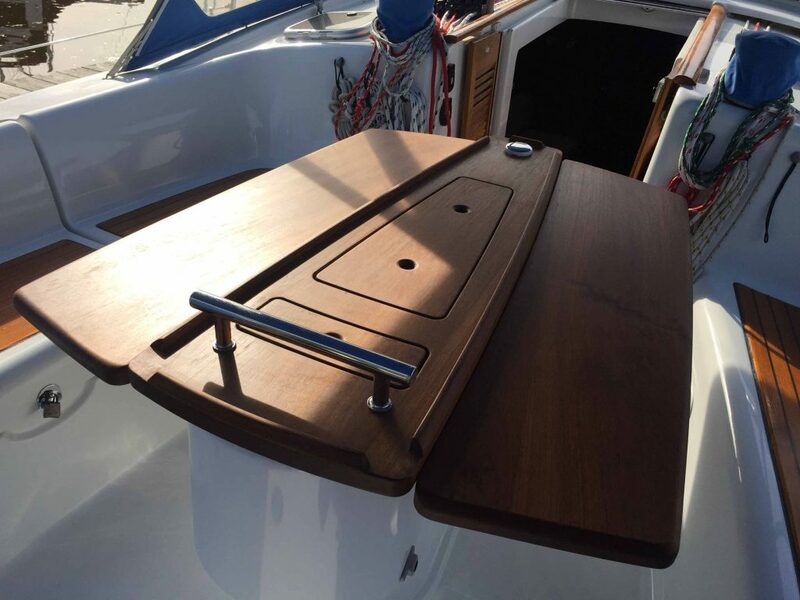 When requested we can also design teak legs, or fit the tables to attach directly to the main mast or the transom. The size and versatility of folding dining tables enable a variety of inlaid design options, such as mirrored inlays on the top and bottom of the folding leaves. All of our inlay designs are graphically plotted and machine cut to ensure perfect symmetry. Don’t settle for a mundane accessory in your pleasure craft! We also supply dining tables made from sturdy starboard plastic, complete with stainless steel reinforcement, hinges, and legs. We recommend that starboard tables be designed for folding, but are happy to construct whatever tables you desire. 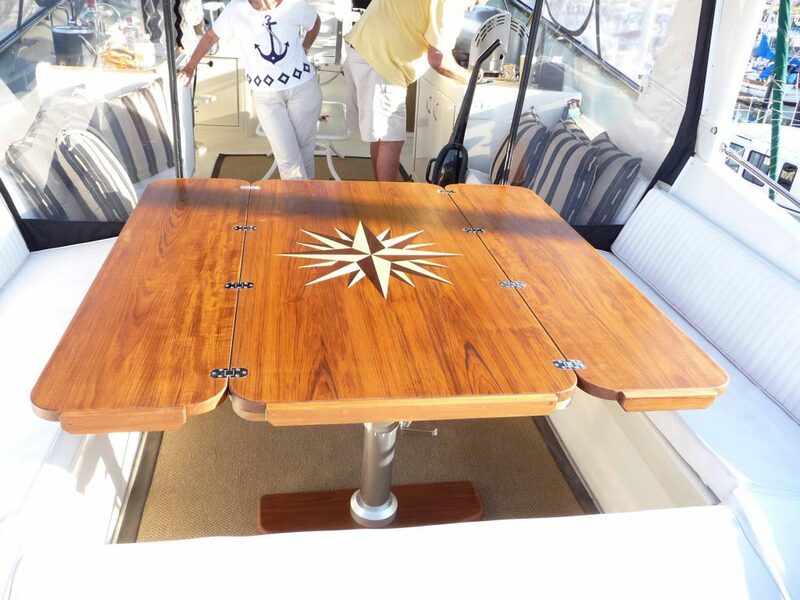 For outdoor and indoor dining our tables are a perfect fit for sailboats (particularly Catalinas) and yachts. Please contact our office to see what design options are available for you. It’s our pleasure to ensure your table needs are met to your exact specifications. We at Cruising Concepts have been creating custom marine cockpit tables for over 30 years. 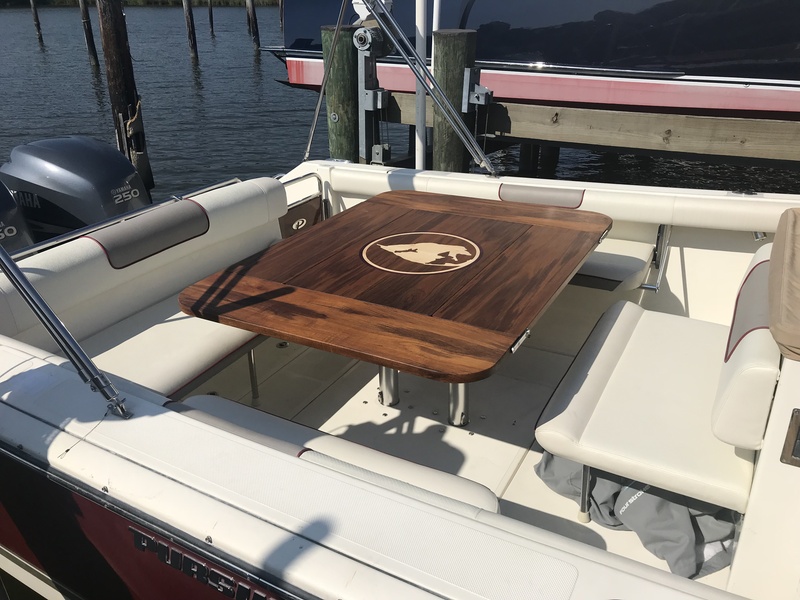 Specifically requested designs and inlays make each of our boat tables a precious and functional work of art and engineering! Our custom teak cockpit tables are constructed from solid planks of teak–no veneers! We can oil or varnish the tables at your request, or leave them with an unfinished texture for a more classical look. 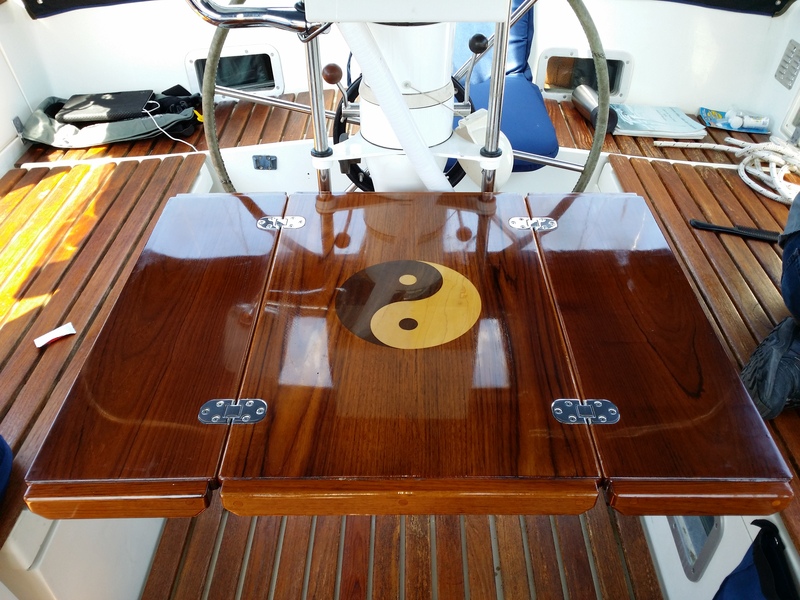 The teak designs can also feature our custom, multi-colored inlaid designs, all according to your request. Teak is our preferred product material and we are proud to take on any design challenge for your teak cockpit table. At Cruising Concepts we hold a special place in our hearts for Catalina sailboats and have special expertise in designing cockpit tables for any dimension of sailboat. In addition to our transom mount options we can also design the table to be capable of binnacle mounting when the ship is at anchor. Our ability to cut tables for any needed size allows us to provide cockpit tables that can be moved, stowed, or affixed as the customer desires. Cruising Concepts also offers a range of cockpit table sizes made with durable starboard plastic. Our line of starboard cockpit tables are made from solid HDPE plastic and are not edged ensuring longevity and aesthetic consistency. All of our starboard tables are made from solid, 3/4″ materials and are supported by stainless steel. We use folding brackets to safely support our folding leaf cockpit table designs. The hinges are designed and installed to avoid interruption of the table surface area and ensure smooth folding in any circumstance. Cruising Concepts has experience in providing any type of folding design above or below the table base. We also enjoy adding custom inlays into the table leaves for strong thematic appeal.